Right now I am surrounded by a bunch of works in progress and unfinished objects that I just can't seem to get completed. My DH is recovered from his recent illness and I am managing to win the war against my cold (despite losing a few small battles - 2 days in bed). So now I am trying to focus on finishing up some projects. So far I have completed a bunch of Kanzashi-style flowers. I've turned them into bobby pins, brooches, head bands and hair elastics. 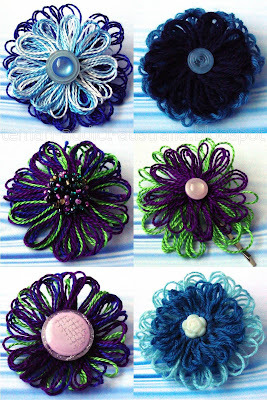 And also completed are some scribble yarn flowers too. These have almost all been turned into brooches. I am still working on my Blue Stars class Temari. Slowly slowly goes it, so many other students have done the most marvellous jobs on their Temari from this class. I think Michelle (temari by the sea) has made the most lovely set of Temari using the class notes. My favourite is the is stitched with white and blue on a pale blue base... just indescribably beautiful... what else can I say... my heart skips a beat when I see it. I hope to share the finished Blue Stars temari picture next time. Another year older... but am I any wiser?